The Varsity Boys Basketball team lost to Tecumseh Tuesday night 53-41. Malik Greene led the Mounties with 11 points and 3 assists. Shaquille Greene had 9 points and 7 rebounds. Noah Olmsted had 8 points, Riley Horsch 6, Rodney Stevenson 5 and Blake Ryan 2 points. They return to action Friday at Western at 6:00pm. The MS Wrestling Team traveled to Hillsdale on Saturday to wrestle and took 5th out of 13 schools. Placing for the Mounties were: 1st Place – Chris Boyer & Andrew Mintefering 2nd Place – Loren Mason & Jerry Trivette 3rd Place – Noah Jakubus 4th Place – Griffin Stern & Brad Campbell CONGRATULATIONS GUYS!!! Mounties News · Feb 8 Jessica Delaney Signs with Ferris St! 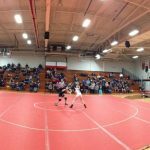 The wrestling team defeated Ypsilanti in the District Semi Finals before losing to Chelsea 38-25 in the District Finals. This ends their regular season. They will be wrestling Saturday at Mason in the MHSAA individual tournament.